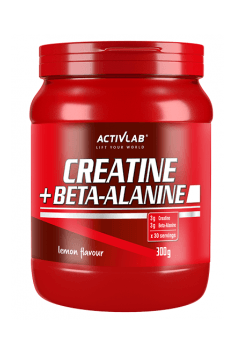 Activlab Creatine + Beta-Alanine is a dietary supplement which contains ingredients with a positive effect on physical performance, especially during very vigorous and short exercises. Creatine helps enhance the effectiveness of muscle function during the first seconds of sprint workouts whereas beta-alanine allows you to train longer and reduces and delays a feeling of fatigue. Owing to such effects, the formula enables you to achieve maximum performance in any kind of sport! Creatine monohydrate – is a molecule occurring naturally in the body. The main organ that synthesises this compound is the liver. However, this process has been also observed in kidneys and pancreas. After entering the body, the active substance from the supplement or food is absorbed in the intestines. It can enter the bloodstream due to the sodium-dependent transporter encoded by the SLC6A8 gene. Subsequently, a creatine molecule with carbohydrates gets into muscle cells where it has a vital function. As a monohydrate, the active substance ensures high hydration of these cells. Creatine has a positive impact on energy production as ATP inside muscle cells. During metabolism, the molecule is broken down into a high-energy phosphate group and ADP. The active substance binds phosphate compounds and thus leads to the formation of the compound called phosphocreatine. It helps donate effectively a phosphate group to an ADP molecule to accelerate the synthesis of adenosine triphosphate. It helps maintain for a short time high energy levels during a sprint workout. Such effects of creatine contribute to an improvement in the body’s efficiency. Apart from a direct impact on ATP synthesis, the active substance creates a perfect environment for different intracellular processes. This is due to the fact that it improves cell hydration. This increases their size and activates mitogen activated protein kinases (MAPKs), consequently stimulating effectively the synthesis of new muscle proteins. There are studies which say that creatine has a positive impact on the activity of myostatin. This protein is like a “brake” which protects muscles against hypertrophy. Results of some studies show that creatine may inhibit the activity of this protein which may maximise the body’s potential for building muscle tissue. Beta-alanine – a non-protein form of the amino acid alanine. Like creatine, the active substance exhibits an ergogenic effect on the body. It consists in that beta-alanine is used in the body for the synthesis of carnosine. It acts like a buffer which helps maintain a stable pH inside the muscles for a longer period of time. This reduces a negative effect of lactate on the effectiveness of muscle function. Unlike creatine, beta-alanine has a positive impact on endurance training. This is due to the fact that aerobic exercise leads to an oxygen debt which contributes to the formation of lactic acid, a by-product of glucose breakdown. Its reaction causes a drop in pH inside muscles as you continue a training session. This deteriorates conditions for energy synthesis and efficient function of protein muscles. The carnosine molecule binds hydrogen ions and that is why it regulates your pH level which is critical to efficient muscle function. In addition, since it resembles structurally some neurotransmitters, it may have similar effects to caffeine. Owing to that, it helps maintain maximum stimulation and focus during training. Creatine + Beta-Alanine by Activlab is a supplement which allows you to maximise the body’s training efficiency. Its carefully selected formula provides perfect support for athletes – it helps train longer and harder and may delay effectively fatigue. Acidity regulator - citric acid, aromas, anti-caking agent E551, sweetener E955, coloring: E104 (lemon flavor and orange), E110 (grapefruit and orange flavor), E124 (grapefruit flavor).